It's not often that I use only one kit for an entire LO - fortunately it worked out in this case. That's three LOs I've gotten out of this kit, so I'd say it was worth the cost. I did this LO for this week's scraplift challenge at the digichick. Thought I'd share a few tips in case you hadn't run across them elsewhere yet. For the date text that is on the curve of the curve I used a text template since PSE doesn't do text on paths. But then I also changed the blending mode for the text to overlay which made it blend into the background paper - changing the opacity would have given similar results I'm sure. Blending modes are a neat thing to try if you haven't already. For the labels I used the Embossing Tape font, but it's flat looking, so I used the emboss filter. I haven't figured out how to get it to be any color besides gray when I do this so I have to recolor the text when I'm done, but I like how it looks. 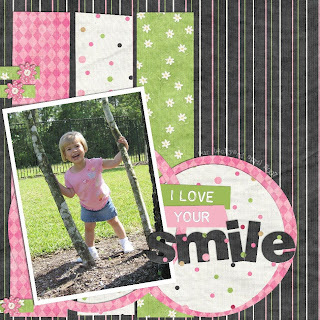 For the word smile, I found a new font - Soopafresh at dafont, typed in the text, simplified the layer and then covered it in a paper from the kit. Since it was also dotty like the white paper and I had the text exactly where I wanted it before I clipped the paper, the dots from the black & white papers match up exactly - I thought that was a cool effect. Then I added a drop shadow and a simple outer bevel to give it dimension. Now for the conclusion of From a Little Baby. I won't make you wait any longer to get the final pieces, they are all here - Part 4, the Template and the Add-On. The Add-On includes some word art & an alpha. I've set the template up to be super flexible, so I hope it helps you track your child's growth. 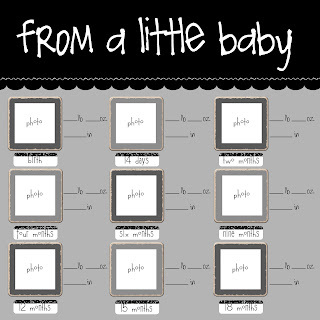 The size labels are available in 3 different fonts, and if you do a 2 page LO it will go from birth to 10 years. Thanks for the comments - I can't wait to see some LOs! The number of downloads has dropped by about a 100 with each part, so there should only be about a handful that get these last two pieces. Interestingly to me, part 1 keeps getting more downloads each day, but not the others hmmmm??? these are WONDERFUL, sarah! that is so interesting that the downloads have gone down with each set...b/c i think each new set is just as beautiful as the last!! thank you so much for sharing your talent to those of us who aren't as creative LOL!! Thank you, thank you, thank you! I love this kit and am so happy that you are sharing with us! Thanks for sharing! I really love looking at your layouts (I have twins too, boys). I get all sorts of neat ideas. :) No idea why your downloads have gone down w/each kit... I downloaded them all, even though I don't have girls! Thanks so much Sarah for this adorable kit! Love the colors and the tags and template are really great! 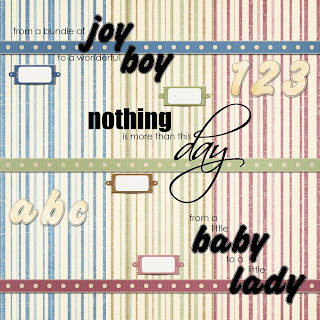 Wonderful layout for the scraplift challenge and thanks for the tips! Great layouts and love the template and kits! I am sure someone must have your first post listed on their blog or something that is driving more hits to it. Happens all the time to people. I think all of them are great!!!! I have some layouts on my blog that you should check out! ;) LOVE how they turned out!!! I love the set - thank you so much. The template is perfect for my son's baby book that I have been working on. You are so talented. Thanks for the this beautiful BIG kit!! I just picked up the final parts. Just lovely!